News for all Westin fans - Winter Offer at CARiD! - Ford F150 Forums - Ford F-Series Truck Community. If you want to bring out your truck's off-road personality, Westin is the first name to consider. Their product line includes truck accessories, designed to ensure protection for your make/model and improve the looks. Only now Westin gives you an exclusive chance to put up to $100 Bucks back in your pocket. 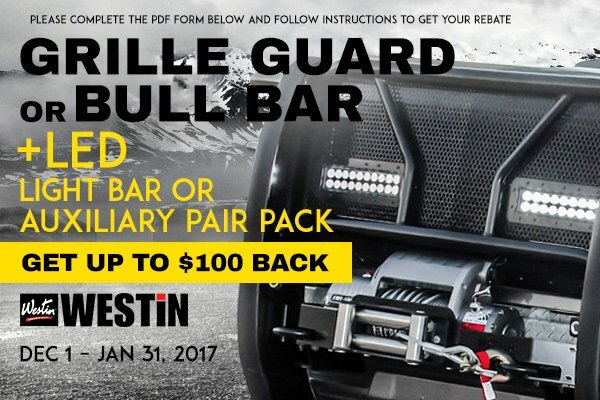 Purchase a qualifying Westin Grill Guard or Bull Bar AND Led Light Bar or Auxiliary Pair Pack and get up to $100 Cash Back. Act now, this offer expires on January 31, 2017. Don't miss this great offer and make some presents for your 4wheel friend from Westin! Quick Reply: News for all Westin fans - Winter Offer at CARiD!